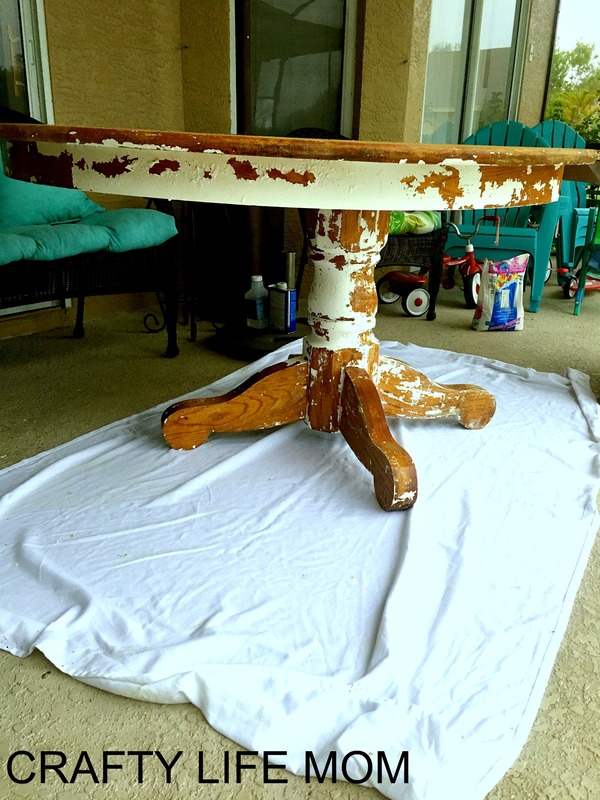 DIY Farmhouse table makeover tutorial how to strip and re stain your table. 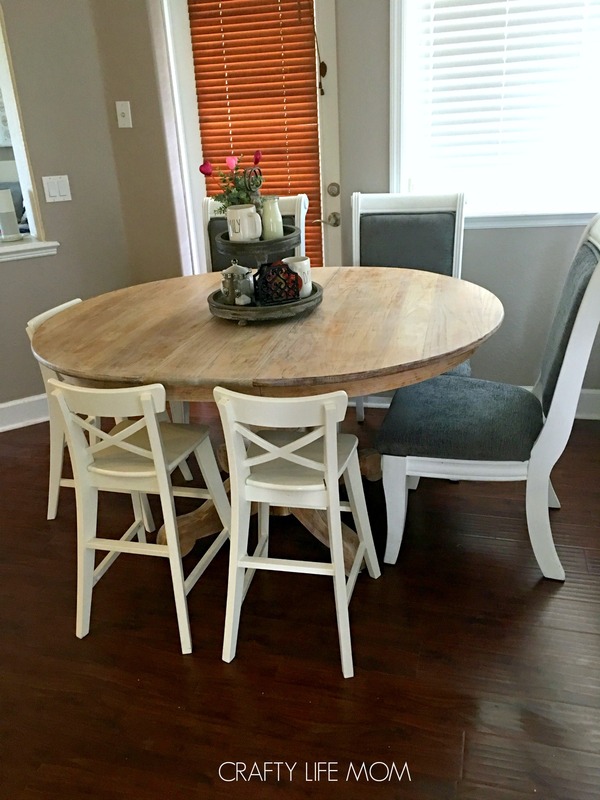 A couple of months ago I decided to makeover our family kitchen dining table. I previously bought this table on Craigslist a few years ago. I had a pub style table before that just was not working when it came to little kids. So I bought this table and it was originally a golden oak color stained table. I removed the table extenders and painted the table white! However, over the last few years, the table extenders sat in the garage. 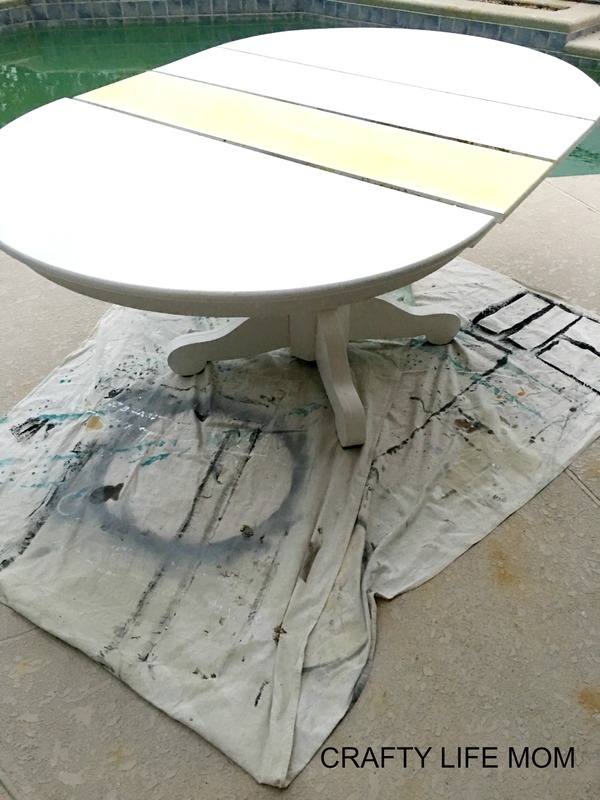 They were painted white as well when I painted the table, but they turned yellow. 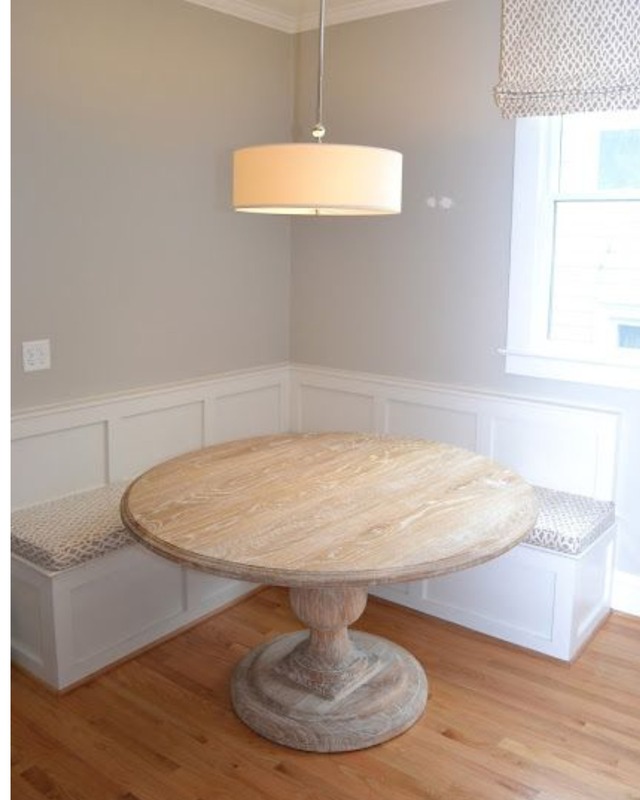 And just recently within the last few months, I decided to make our table oval instead of round. This meant I needed to put the extenders back inside. But, the odd shades of white and yellow just didn’t cut it. Re-painting the table was the inevitable task ahead of me. So I put it off. Once I finally got ready to re-do the table, I gathered up the supplies I needed to do the job. Here’s a list below if you are planning to do something like this. I used two kinds of paint stripper. I will explain why and how I used them. Mineral Spirits – to clean the existing surface from any food bits, dust, or grime. Gloves – unless you don’t care for your hand to get nasty! Paint scraper tool – this is so helpful when getting all the nooks and crannies around the base. Sander – I used an electrical sander (like this one) to help make the job faster and easier on the hands. Sand Paper – 330 and 220 grit. Rags and Cloths – for obvious reasons. New stain – I did a very natural wood stain. Wax or Sealer – this helps hold the color of stain and prevents any unwanted staining form food or drinks getting into grains of the wood. Also helps with easy cleanup. Once I had everything, I got to work! 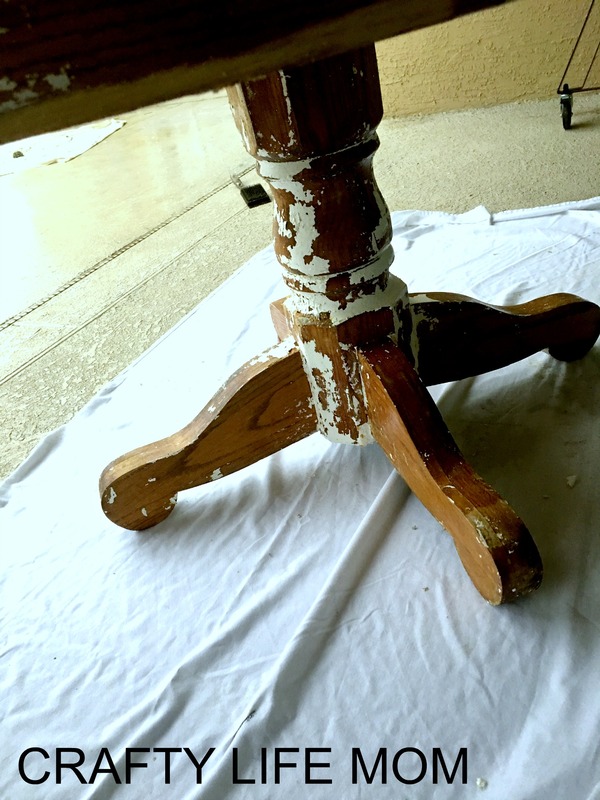 If you have ever de-glossed or removed a stain or paint form any piece of furniture, you know that it is not an easy job! It took me almost 3 days to remove all the paint. I did not do full days, I just worked in a couple hours here and there. I am sure you could stip it all in one day if you wanted to. 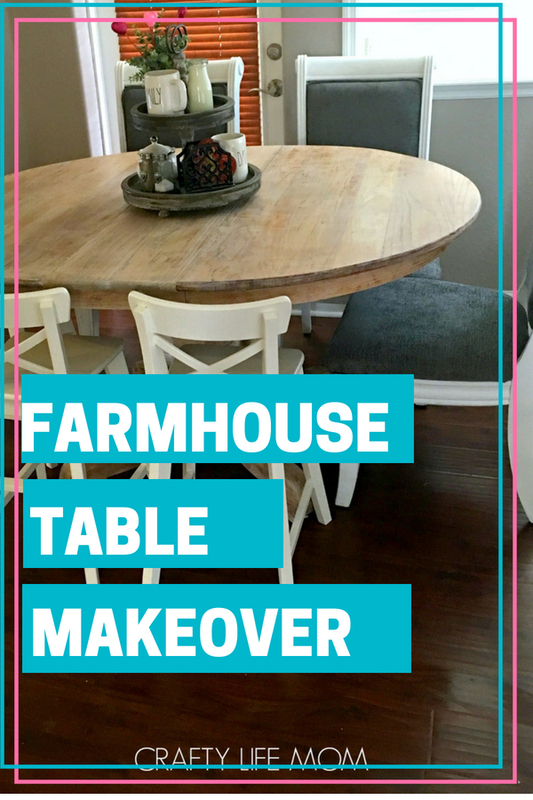 But for me, with life kids and all of the above, this DIY farmhouse table makeover took me more time over the week because I spread it out. First I stripped the table. For the table top, I used the stripper that comes in a bottle. For the pedestal, I used the spray and let it sit a bit to really kind of get through the thick of the paint. You can tell it is working when it really starts to bubble and almost peel off the table. I had to spend a little extra time on the bottom, working through all the nooks and crannies. I also had to bust of the sander to get in some cracks that wouldn’t budge. Even at the end of it, I don’t think I entirely got every single piece of previous paint removed. I was going for the worn farmhouse vibe anyway. So a few used looking sections didn’t bother me. The picture below is one I found on Pinterest. I apologize that I do not know the source, but I believe this is from Joanna Gaines’ show Fixer Upper. 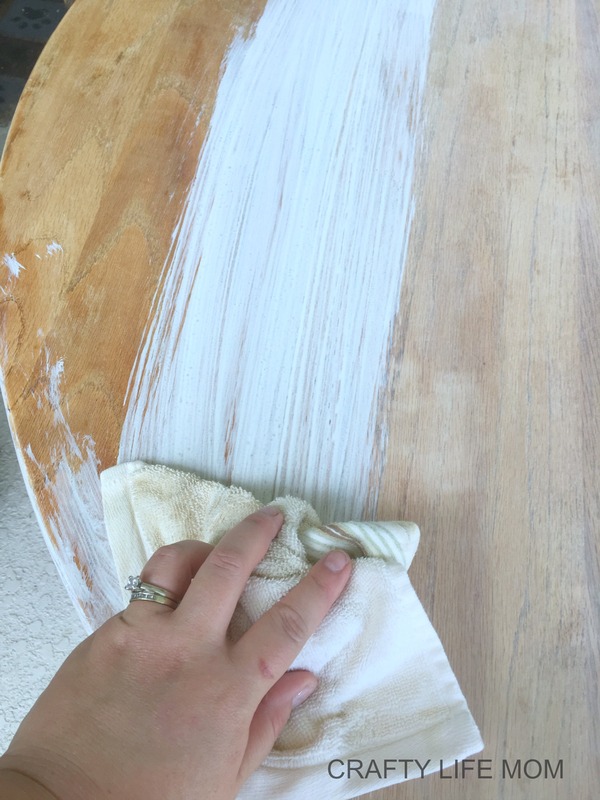 Once my sanding was complete, I got to whitewash staining my table. Once this was complete, I decided to go ahead and apply a wax over the entire table. I used Annie Sloan’s furniture wax. This was is mostly used when painting with chalk paint. I am not the biggest fan of using chalk paint when it comes to furniture. However, this what makes a piece really great. And if you do use chalk paint, you need this wax to really make the piece. It also gives a nice finish and more professionally done look. Once dry, I moved it back into our kitchen dining nook! I just love the way it turned out! What do you think? ?